Do want to look amazing at the age of 50? Then try some short hairstyles that can make your look more attractive and younger. The hairstyles in short length can make your appearance not only young but also very smart and attractive in the gathering. There are different kinds of modern hairstyles that you can follow to manage your hair at the age of 50. You need to take the advice of the hairdressers who can suggest you the best Short hairstyles for women over 50. Fashion is changing day by day, and accordingly, you can adorn yourself to look best in the crowd. The popularity of the mix and match hairstyles is growing high. The expert hairdressers are trying to mix and match some haircuts according to the shape of the face to make your look more perfect. These small additions to the simple hairstyles can make your look different and stylish. You need to understand your personality and purpose of cutting the hair and the style should be selected accordingly. When you are entering the middle age, you need to keep in mind any hairstyle is not for you. You need to be selective and choose a mind-blowing short hairstyle to look gorgeous as well. If you want to get a messy look, then nothing can give you a better look than the Feathered Pixie Hairstyle. The sharp ends of the feather style hair make your appearance prominent. At the age of 50, you can hold back your youth b cutting the hair in this pixie style. The uneven lengths of the feather style hair can give you a perfect messy look. The hair is cut up to shoulder. The Short Layered Hair is another style that can make your look younger even at the age of 50. The hair is cut up to your shoulder in layer style. The longer layer on the front side can make your appearance smart and cute. The side-parted hair in uneven layers can make your appearance stunning and bold. At the age of 50, you can try the haircut named Platinum Blonde Pixie to look unique in the crowd. In this haircut, you will get some uneven hair with sharp edges on your forehead. This cut makes your appearance more prominent. The backside of the hair is cut up to your shoulder. The uneven ends of the blonde style haircut can make it more unique and notable. The Highlighted Layered Pixie hairstyle can make your look more dynamic in the crowd. You get some highlighted layers of the hair in this style. The hair is cut into pixie style to leave an uneven and messy look. The front layers are cut into longer length, and the backside hair is cut above the shoulder. This overall highlighted hair strips in layer shape look stunning. Short Pixie haircut makes your look prominent in the crowd. The uneven and sharp hair edges in this cut can make your appearance not only prominent but also very smart and bold. You can manage this haircut easily as the hair of the front side cut into the short length. It makes your thin hair looking puffy at the age of 50. The combination of bob and layer haircut looks good at the age of 50. The layers are cut into a different style in this cut to make your look more prominent. Side parted front hair on the forehead can make your appearance different in the crowd. The hair length goes up to shoulder with this hairstyle. If you want to look smart and appealing at the age of 50, then you can try the pixie hairstyle for women. This hairstyle is perfect for the middle-aged women who want to hide their thin hair. In this cut, the hair is cut into extreme short length. The uneven edges of the short hair in pixie style can give you an exceptional look. Straight hair can be cut into the bob style to make you look smart and prominent in the crowd. The hair is cut up to the length of the shoulder. The front hair is cut in shorter length, and its appearance on the forehead can make your look more unique in the crowd. This stylish bob cut hair looks perfect on the women at the age of 50. The side swept combination with the bob style hair can make you look smart at the age of 50. The shirt length hair with uneven ends makes a messy look on your head. The side-parted swept on the bob cut hair looks perfect on the oval-shaped face. The length of the backside hair goes up to shoulder. If you have straight and short hair, then you can try a modern cut. In this cut, the hair is parted on one side, and the hair is cut into uneven edges. The shorter length hair on the forehead with the longer length hair on the backside makes your look smart and unique. The sharp ends of the hair leave a prominent look on your face. Curled Bob is one of the most dynamic haircuts for the women who are crossing the age 50. If you have curled hair, then you can try the bob style cut on your hair. The curly hair in this cut makes your hair looks puffy and thick. This style of hair looks perfect on the round shape face. The cropped layer cut is another mind-blowing style for the middle-aged women. You look terrific in the shorter length of the hair on the front side. The straight hair up to your shoulder looks good, and it gives your face a perfect shape as well. This hair looks puffy on your head and makes you look young. Blonde bob is one of the most interesting hairstyles for the women of over 50 ages. You can improve your appearance by changing your haircut into this short hairstyle. The wavy style of the hair up to the length of your shoulder makes your face more prominent and unique. It makes your face round and perfect. Short spiked hair is always modern looking, and you can make your appearance more prominent in this haircut. You the short length hair in spike cut can hide the thinness of the hair volume. The spiked hair with sharp ends leaves a messy look on your hair. The hair ends above your shoulder and makes you look smart and bold. If you like bob cut hair, then round shape in it can make your look more attractive. The round shape bob cut hair can make your face more proper in shape. The side-parted hair in this cut can make your face not only round but also very prominent and attractive at the same time. This haircut can make you look young with the length up to the shoulder. The side-parted curly hair in short blonde bob cut can make you look fantastic. Hair length ends above your shoulder, and the wavy appearance of the hair makes you look different from others. The blonde cut hair looks perfect for women who want to look smart and unique in the crowd. If you mix the bob style with it, then it becomes more suitable on your face. Pixie haircut makes the looks of the middle-aged women perfectly young. You can color your messy hair in wine red color to look more attractive in the crowd. The pixie haircut on the middle-aged women stands unique, attractive and stunning. The uneven texture of the hair with sharp edges makes your look stunning in the crowd. The classy and elegant hairstyle like tapered bob haircut can make you look stunning. You can carry this hairstyle easily in the crowd. The straight hair cut into the length of the shoulder. The side-parted hair with shorter front strips can give your face a proper shape. The bob cut of the hair makes it look puffy. Edgy pixie style is perfect for the middle-aged women who want to look classy and elegant. In this style, you can hide the thinness of your hair at this age. The sharp edge of the hair makes the cut more prominent and makes it different as well. The uneven length of the hair leaves a messy look to make you smart looking. If you want to make your appearance smart yet humorous, then the funky style spike hair in short length can make you amazed. The spiked hair on the middle of the scalp with the shorter hair on the front side can make your appearance remarkable. This casual hairstyle with sharp-edged hair makes your look prominent. This is one of the most amazing haircuts that can make your look like celebrities. The bob cut hair in the retro look with curls can make your appearance stylish and smart at the same time. The length of the curls above your shoulder gives a round shape to your face. The hair is parted on one side and make you look glamorous. If you are thinking how to look young after crossing the age 50, then you need to try the Bobby Pinned Updo haircut. 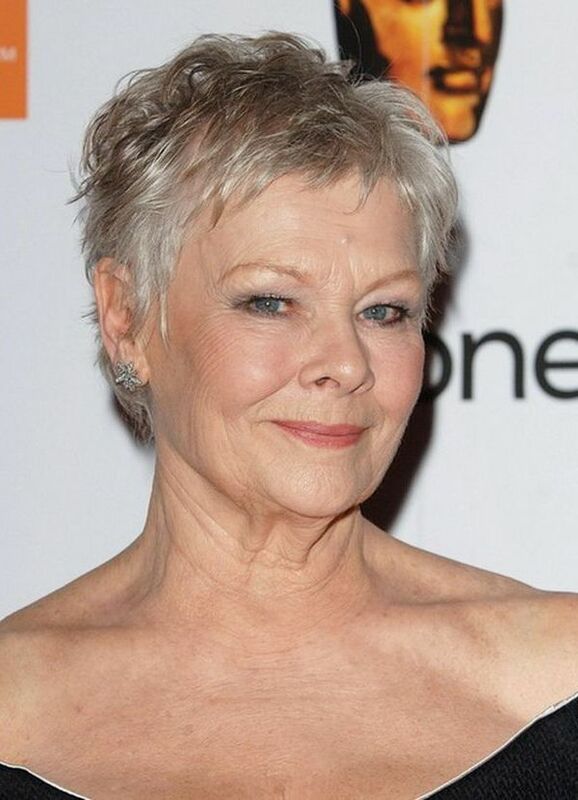 This modern and elegant haircut can suit the old women with white hair. The side-parted hair with uneven hair ends above your shoulder. In this haircut hair of the one side remains longer than another side. This gives you a unique and younger look. The edgy short blonde style hair is another prominent hairstyle that can make your appearance not only bold but also very prominent and messy. The sharp edges of the hair in uneven length on your head look messy. It also hides your thin volume of the hair at the old age. This hairstyle looks young and smart on the women aged over 50. If you want to look cute at the age of 50, then you can try the Platinum Blonde Bob haircut. In this style, the hair is cut up to your shoulder length. The side-parted hair in this cut looks smart and elegant. This cut can shape your face round, and the sharp edges of the hair make your look prominent as well. This is for the women who love extreme short length hair. In this Faux hawk Haircut, you get the long stiff hair in the middle of the scalp, and the hair on both sides remains shorter than the middle. This unique style makes your look unique in the crowd, and it can hide the thinness of your hair as well. If you have curly hair, then the bob cut can make you look different in the crowd at the age of 50. In this cut, the curls beside your ears up to shoulder look puffy and thick. The hair is parted on one side to make your look more dynamic and classy at the same time. The blonde style bob cut hair is one of the amazing haircuts that can make your appearance smart and cute. In this gorgeous hairstyle, you can get a round shape prominent face. The hair is slightly curled and cut up to your shoulder. In this stylish hairstyle, you can look not only cut and young but also very elegant and classy at the same time. If you like crop curly hairstyles, then cut it into bob style to get the ultimate look in the gathering. In this prominent hairstyle, you can look modern at the age of 50. The hair is cut at the length of the shoulder. The sharp and uneven edges of the hair in this cut make your face prominent. Multiple layers in the short length straight hair can make your look wonderful even at the age of 50. In this hairstyle, you get hair with sharp ends that make your presence prominent in the crowd. The hair is parted on one side. The hair is cut to the length of your shoulder to make you look stunning and smart. The texture of the hair is the unique in this hairstyle. The Textured Bob cut hair is not only smart and bold looking but also very elegant as well. The hair is cut up to the length of your shoulder. It gives you a messy and smart look in this hairstyle. The edges of the hair in this cut keep uneven, and that makes your look more exceptional in the gathering.